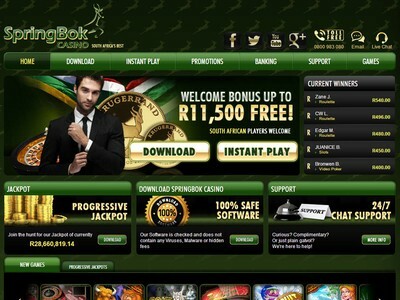 Springbok Casino is a leading South African online casino which is powered by downloadable and non-downloadable Realtime Gaming software. Register a new account here and you will automatically qualify for a R11,500 welcome bonus (Euros and US dollars also now accepted). Make your first deposit using bonus code: SPRINGBOK100 for a 100% deposit match worth up to R1,500. When you make your second and third deposits, remember to use the bonus code: SPRINKBOK50 and you will receive a 50% match bonus worth up to R5,000 for both of those deposits. There is also an 'Exclusive' bonus available on any deposit that you make into your Springbok Casino account using code: SPRINGBOK300. This will entitle you to a 300% deposit match worth up to R600. Players can contact the customer support here 24 hours per day via Chat (live chat), email or by telephone. South African players can call toll free on: 0800-938-080. Non-South African players can call: 1-678-349-0095. Springbok Casino is fully licensed in the Netherlands Antilles and the main supported language here is English. Afrikaans language support is also offered. The main game categories include Table Games, Slots, Real-Series Slots, Video Poker, Favorites and Speciality Games. Keep an eye out for popular Table Games such as American Roulette, Baccarat, Blackjack, Craps, European Blackjack, European Roulette, Face Up 21, Match Play 21, Pai Gow Poker, Pontoon, Super 21, Tri Card Poker and Vegas Three Card Rummy. Some of the most recommended slot machines include Achilles, Builder Beaver, Cleopatra's Gold, Dream Run, Gold Beard, Jumping Beans, Loch Ness Loot, Naughty or Nice, Ninja Star, Pay Dirt, Ronin, Spirit of the Inca, The Elf Wars and Vulcan. The vast majority of video slot machines available here have progressive jackpots to play for, plus all of the games are available in the free play mode and in the real cash mode. Popular online casino banking methods that are accepted here include (in no particular order), MasterCard, Visa, Wire Transfer, Skrill, NETELLER and ECOCARD. Downloading the casino software will give you access to more than 100 exciting online casino games. Frequent real cash players will also be well looked after thanks to the generous VIP program and registered member scan also sign up for daily and weekly online slot tournaments.